Talk-show host and founder, Harpo, Inc.
From an early age, Oprah Winfrey was comfortable in front of crowds. Her ease with audiences while simply being herself helped her become the most popular talk-show host in the United States. Winfrey, however, did more than explore hot topics and interview guests. She prodded her audience—dominated by women—to help others and find meaning in their lives. Through her show, her magazine 0, and her public appearances, Winfrey emerged as a sort of preacher with an important message: "Live your best life." While using her own "power for greatness" and helping others find theirs, Winfrey built a corporate empire, Harpo, Inc. Winfrey readily admits she is not much of a business woman. Instead, she relies on the skills of her executives and her own instincts. So far, those instincts have proven strong, as most of her projects have connected deeply with an audience that looks to her for information and inspiration. "Don't complain about what you don't have. Use what you've got. To do less than your best is a sin. Every single one of us has the power for greatness, because greatness is determined by service—to yourself and to others." Winfrey, the wealthiest African American woman ever, faced hardship and personal problems before hitting the road to stardom. She was born on January 29,1954, in Kosciusko, Mississippi, the product of a brief affair between teenager Vernita Lee and Vernon Winfrey, a twenty-year-old soldier. (Winfrey later acknowledged that she and her mother had no proof Vernon Winfrey was her biological father.) Baby Oprah was supposed to be Orpah, a name taken from the Bible, but a mix-up on her birth certificate made it Oprah. Winfrey and her mother spent several years living with Lee's parents on their farm. Like many poor, rural families of the era, the Lees had no indoor plumbing, and the family wore homemade clothes. After several years, Winfrey's mother left her daughter with the grandparents to live in Milwaukee, Wisconsin. Winfrey's grandmother taught her to read before she was three. Winfrey also began speaking at the family church, reciting sermons. Adults loved the smart and assured young girl. Other children, however, taunted her. At age six, Winfrey went to live with her mother in Milwaukee. Except for one year when she lived with her father in Nashville, Tennessee, Winfrey stayed in Milwaukee for the next eight years. During that time, Winfrey was sexually abused by male relatives and their friends. At fourteen, she had a premature baby that died after birth. Winfrey kept her teen pregnancy a secret for many years. Her half-sister Patricia went public with the story in 1990. At the time, Vernita Lee was on welfare and unable to control her daughter. She tried to put Winfrey in a home for troubled teenaged girls. The home was full, so Winfrey returned to Nashville to live with her father. While living with her father for the first time, at age eight, Oprah Winfrey amazed church audiences with her speaking skills. She also took notes on the minister's sermons, then gave her own version the next day on the school playground. Her second stay in Nashville changed Winfrey's life for the better. Her father and stepmother Zelma were respected members of Nashville's black community, and they gave her both discipline and love. Winfrey became active in the church and excelled in school. She also entered and won several local beauty contests. In 1971, she was named Miss Black Tennessee. The same year, she got a job reading the news part-time at WVOL, a local radio station. Winfrey kept the job when she entered Tennessee State University, where she majored in drama and speech. In 1973, while still at Tennessee State, Winfrey moved to TV news, working for WVTF. She was the station's first African American female woman anchor. Winfrey left college to pursue TV news full time, although she completed her course work years later to receive her degree. After three years at WVTF, Winfrey moved to WJZ in Baltimore, Maryland. For the first time in her young career, she failed. The casual, warm tone that she used in Nashville did not fit with her new station's more "professional" approach to the news. Winfrey was removed as the evening news co-anchor in April 1977 and ended up as the co-host of a morning talk show, People Are Talking. She later told Time that, "The minute the first show was over I thought, 'Thank God, I've found what I was meant to do.'" Locally, People are Talking began to draw more viewers than the nationally syndicated Phil Donahue Show. WJZ tried syndicating the show, but only about a dozen stations agreed to air it. Winfrey, meanwhile, developed the style that would make her the top talk-show host in the country. She asked questions that explored her guests' deepest feelings, and viewers saw her as someone they could trust—a good friend who came into their homes on a TV screen. In 1987, Winfrey won her first Emmy Award as a talk-show host; her program won the Emmy for Best Daytime Talk Show. By 2002, she and The Oprah Winfrey Show had won more than thirty Emmys. Winfrey's other honors include a Lifetime Achievement Award from the National Academy of Television Arts & Sciences and a gold medal from the National Book Foundation, for her efforts to promote reading. 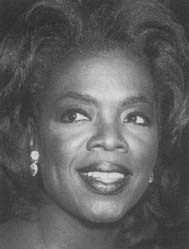 In 1983, Winfrey left Baltimore to take over the morning talk show on WLS in Chicago—the program that became The Oprah Winfrey Show. Her rapid success in the new market led to another syndication deal. This time, Winfrey and her show were a hit across the country. Her role in the 1985 movie The Color Purple boosted her recognition. In 1986, Winfrey appeared in the film Native Son. That same year she also formed Harpo Productions, to take a more active role in television and film production. But no matter how many other projects she launched, Winfrey was best-loved for her talk show. Within a few years of starting her daily show, Winfrey was famous for talking about her personal struggles and successes on television. She always felt she was overweight, so in 1989 she went on a liquid diet and lost sixty-seven pounds. Winfrey then wheeled a cartload of animal fat onto the stage of her show, representing the weight she had lost. In future years, her fans followed her constant struggle to lose the weight she eventually regained. On a more emotional level, Oprah used her show in 1991 to reveal her past sexual abuse. In a later show, she talked about using drugs to try to satisfy an old boyfriend. Her current love life also made headlines, as tabloid newspapers reported on her relationship with Stedman Graham, a Chicago educator. The two met in 1986 and have lived together for many years. Winfrey used her interviewing skills and personal warmth to draw out painful information from guests who appeared on her program. Some newspapers and magazines talked about the "Oprahfication" of America—the tendency to use talk shows as a form of therapy for guests and the studio audience. Not everyone welcomed the trend, especially if the topics were sexual. By the mid 1990s, Winfrey decided to move away from the more questionable topics, and begin focusing on the positive qualities in people and her own life. Her show began to take on a more religious or spiritual feel. In 2002, she told Fortune her show was not just a product, "It's my soul. It's who I am." With her strengthened desire to be a positive influence, Winfrey started her book club in 1996. The next year, she began "Oprah's Angel Network," which asked viewers to donate their spare change to worthy causes, such as education and building homes for the poor. Winfrey's vast wealth also let her make generous contributions to different organizations. She donated millions of dollars to several African American universities. After revealing that she suffered abuse as a child, Oprah Winfrey led the effort to pass a new national law designed to keep track of convicted child abusers. Officially known as the National Child Protection Act, it was nicknamed the Oprah Bill. The law went into effect in 1993. Winfrey's more spiritual efforts, however, drew some criticism. In 2001, Oprah launched a speaking tour that encouraged audiences to look within themselves for answers to life's questions, while also having faith in God or some higher power. People reported the reaction of noted writer Barbara Grizutti Harrison to Winfrey's approach: "She thinks she's the messiah, leading everyone to the promised land." Still, Winfrey's devoted fans admired the way she inspired others. Mary Madden, a New York housewife, told Newsweek in 2001, "She's giving me the tools to find myself." The Appeal of "Dr. Phil"
A married couple struggles to restore their happiness. A parent looks for ways to control a difficult teen. These are typical problems guests have brought to the Oprah Winfrey Show, and the man they turn to for help is Dr. Phil McGraw. Known on the show as "Dr. Phil" and "Dr. Tell It Like It Is," McGraw first appeared on Winfrey's show in 1998. The therapist's straightforward approach proved so popular, Winfrey made him a weekly guest. Thanks to his exposure on the show, McGraw has become one of the most famous psychologists in the United States. His three books have become best-sellers, and his talks often draw several thousand people. Born in 1950, McGraw spent most of his childhood in Oklahoma before settling in Texas. He gave up a private practice to start his own company as a legal consultant. McGraw met Winfrey in 1997, when he helped her prepare for her trial after being sued by Texas cattlemen. On Winfrey's show, McGraw offered what the host called "Philisms"—short, direct sayings that cut to the heart of a problem. A typical Philism, as reported in the Palm Beach Post: "Make a decision and pull the trigger." McGraw's popularity has led to another business opportunity for Winfrey's Harpo, Inc. In 2001, the company announced it would produce McGraw's own syndicated talk show, starting in the fall of 2002. Within months, King World Productions announced that Dr. Phil had been sold to more than one hundred stations that reach about 85 percent of the country's TV viewers. Winfrey's fame and spiritual outlook made her a logical choice to serve as host for a prayer service to honor New York's victims of the September 11, 2001, terrorist attacks. With religious leaders of many faiths by her side, Winfrey expressed one of the common themes in her shows and in her life: "May we leave this place determined to … create deeper meaning, to know what really matters." In 2002, Harpo, Inc. was worth an estimated $575 million. Winfrey's other business deals and investments gave her a total worth just under $1 billion. Her personal holdings included a 160-acre farm in Indiana and a California mansion worth $51 million. Lowe, Janet. Oprah Winfrey Speaks. New York: John Wiley & Sons, 1998. Mair, George. Oprah Winfrey: The Real Story. Rev. ed. Secaucus, NJ: Citadel Stars, 1998. Cheakalos, Christina. "Direct Males." People (June 11, 2001): p. 89. Clemetson, Lynette. "Talk Show: 'Oxygen Gives Me That Voice.'" Newsweek (November 15, 1999): p. 64. Farley, Christopher John. "Queen of All Media." Time (October 5, 1998): p. 82. Folstad, Kim. "Dr. Phil: Buy the Book." Palm Beach Post (March 6, 2002): p. 1D. Hollandsworth, Skip, and Pamela Colloff. "How the West Was Won Over." Texas Monthly (March 1998): p. 100. La Franco, Robert, and Josh McHugh. "'Piranha is Good.'" Forbes (October 16, 1995): p. 66. Oldenburg, Ann. "Dr. Phil's Advice: Wake Up!" USA Today (May 8, 2001): p. 1D. "Oprah on Oprah." Newsweek (January 8, 2001): p. 38. Randolph, Laura B. "Oprah!" Ebony (July 1995): p. 22.
. "Oprah Opens up About Her Weight, Her Wedding, and Why She Withheld the Book." Ebony (October 1993): p. 130. Sellers, Patricia. "The Business of Being Oprah." Fortune (April 1, 2002): p. 50. Smolowe, Jill, and Sonja Steptoe. "O on the Go." People (July 16, 2001): p. 50. Oprah.com [On-line] http://www.oprah.com (accessed on August 15, 2002). Oxygen. [On-line] http://www.oxygen.com (accessed on August 15, 2002).